by Hannah the SPEEDY BARREL RACER! This is my art project for 3rd grade when we brought something we loved in and drew it. 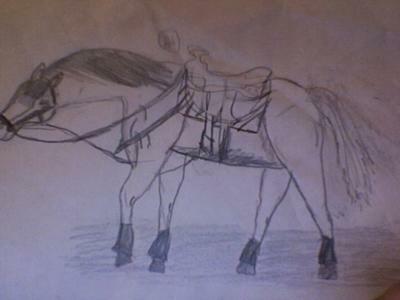 I drew one of my arabian beyer models with its tack on. Its not that great and some of my art is unbelieveable compared to this. That's a really good drawing! Better than I was in 3rd grade, anyway. This drawing is ok... For a 3rd grader it's pretty good, but in general, not the best. I've seen better.